After planning on visiting Sims Steakhouse last weekend I called them on Saturday about WinterDine. To my surprise, they were going to be offering the WinterDine special this week. Finally Thursday came and I finally got to indulge! 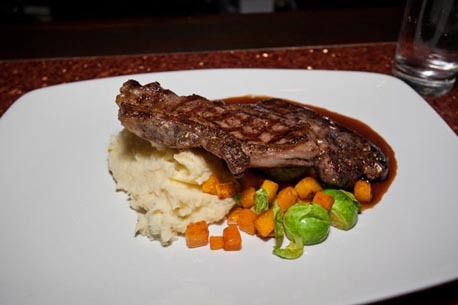 PEI Prime 10oz Ribeye served with Roasted Garlic Mashed Potatoes Seasonal Vegetables. 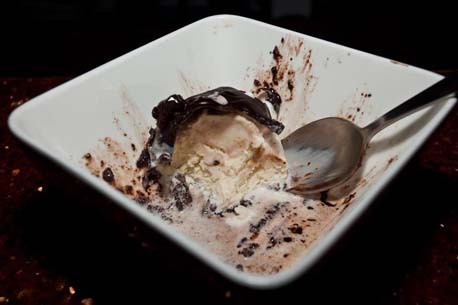 Chocolate Brownie with Cow's Vanilla Ice Cream. My first impressions of Sims Steakhouse was not off to the right start. Like another Murphy establishment I walked into two weeks prior, I was greeted by a big ol' empty room. So I waited, and waited, and waited some more. I started walking around. No alarm went off so I thought they must be open. Then I went back to the greeting spot by the door, then back to the bar and bingo! A staff member on the opposite side of the room (not by the bar). After startling her, she proceeded to greet me like a regular customer. Sitting down by the bar, my first question was, "how many options does the WinterDine menu have". and she informed me, "only the 1". Great I thought, "I'll take it," I said. Shortly thereafter, another server took my drink order and came back with it. 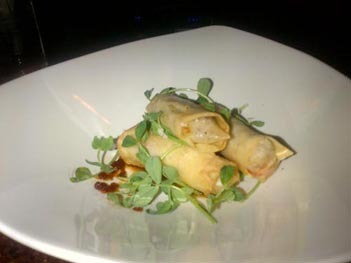 A few minutes later, out comes the chicken spring roll. After taking my first bite into it, immediately I thought, yuck! Why? ONIONS! I am no fan of onions what so ever. So, I used my knife to do surgery on the spring rolls to remove the onions. They tasted much better. After finishing the spring rolls, the next up was the main course. While waiting for the main course, I got curious as to what I was going to be eating. Sure enough, the waitress told me, "PEI prime 10oz ribeye". Ordering it medium, I figured it wouldn't take too long to cook up. After what felt like 20-25 minutes later, it arrived looking deliciously tasty! The steak looked perfectly cooked with some juicy vegetables next to it. My first bite went into the mashed potatoes proved to be extremely creamy with a great light garlic taste. Truly delicious I thought as I continued to eat my vegetables. The mashed potatoes really impressed me as it has been a while since I tasted such a delicious treat. Next up? The steak. The first bite tasted amazing. Not as great as the other steaks I've had this same restaurant, but it certainly was chewy and tasteful. The appetizing look of a nice juicy pink center certainly helped me enjoy this delicious main course. Lastly, after waiting probably about 10-15 minutes was dessert. When the dessert finally made it out in front of me, my mouth wasn't sure what to do. I did not hesitate digging in! The first few bites really made an impression. 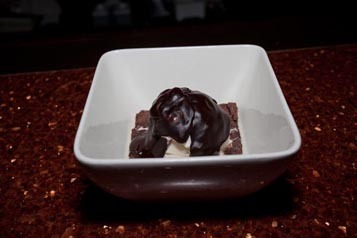 The creative look of the ice cream+brownie wasn't a major hit, but the taste sure was. The moist chewy brownie certainly was an amazing party inside my mouth. Simply amazing. After finishing the dessert, I couldn't believe what I had just finished eating. In fact, I wanted another! Overall, the taste at Sims Steakhouse was the best meal I have eaten during the WinterDine Festival. While the service might not have been perfect, the food wasn't short of amazing. My glass was certainly empty on multiple occasions, but thankfully, I was not too thirsty compared to other days. Now, if only they could extend WinterDine for another week, I'd definitely be going back to Sims Steakhouse!